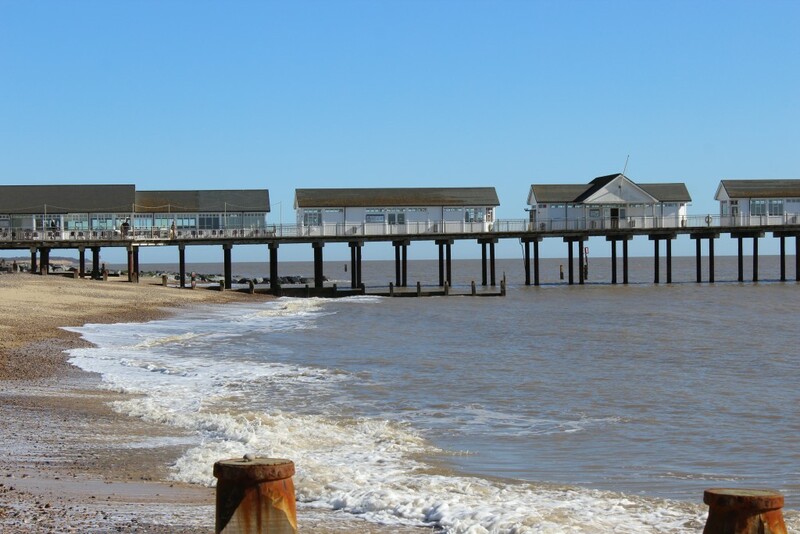 The sun was shining, it was a beautiful spring day and I had a free weekend so where better to start my Suffolk Top 50 Challenge than Southwold Pier and the seaside! I decided to kick off my challenge by visiting Southwold and got very excited as not only could I visit the pier but the Sailors’ Reading Room museum was also on my list which is located along the seafront just a few minutes walk from the pier; 2 for the price of one! Fantastic! I have been to Southwold and the pier lots of times and love it but I haven’t visited for some time so it was great to go back. There had been some changes since my last visit which just goes to show with any place you visit – if you have already been there and done that it may be worth a revisit! 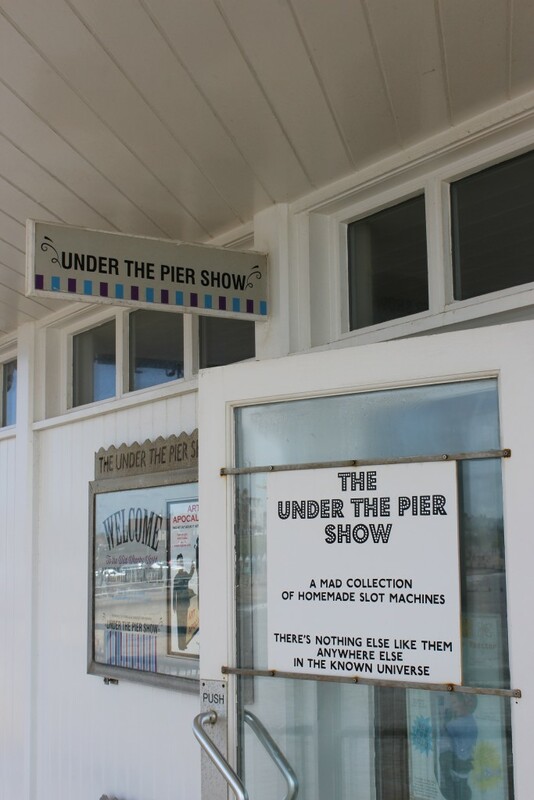 The pier was built in 1900 and had ‘Belle’ steamer ships calling from London, Clacton and Great Yarmouth bringing tourists to Southwold until the 1930’s. Things are quite different today. The 810ft long pier has apparently 940 planks to the end of the pier (I didn’t count them!) and is as popular as ever with locals and tourists with a reported near on a million visitors for 2015 – and some still appear to be arriving via the sea! 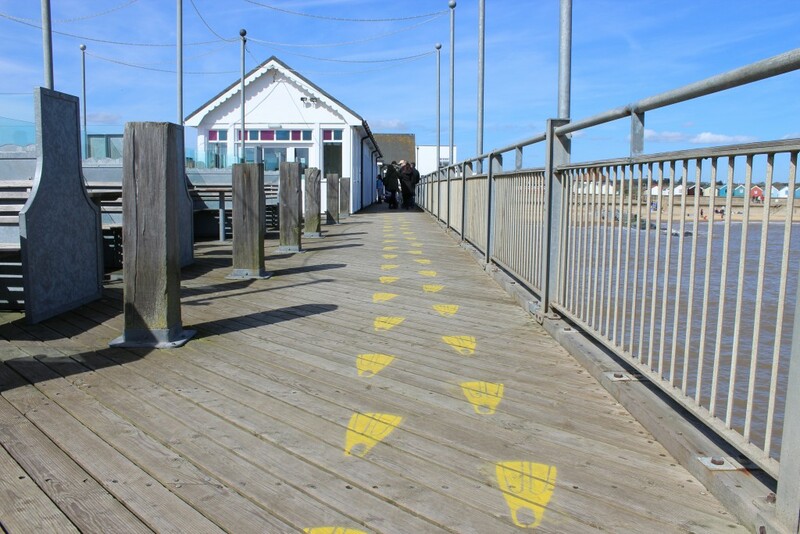 Following ‘footprints’ from the end of the pier to shore! 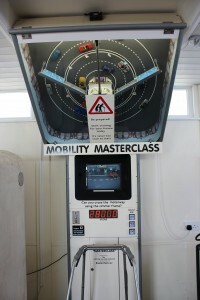 As you may know I am often on the lookout for quirky things to do so it’s no surprise that I like Southwold pier – as you walk along the planks to explore all that it has to offer from the lovely shops to the places to eat you will come across the ‘under the pier show’ and it doesn’t get quirkier than that! Whenever I pop in what I love about it is that there is always lots of laughter as people egg each other on to have a go on the weird and wonderful machines. The giggles were there this weekend too – I saw an elderly man shut the door behind his wife as she entered the Bathyscape to dive to the sea bed (yes he did let her out again!) whilst others laughed as they enjoyed the challenge of crossing the motorway using a zimmer frame and walking a fake dog on a treadmill. Yes definitely quirky! 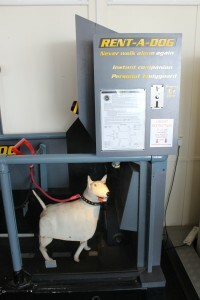 Designed by Tim Hunkin the Under the Pier Show has been on the pier since 2001 it really does offer something different for all ages! 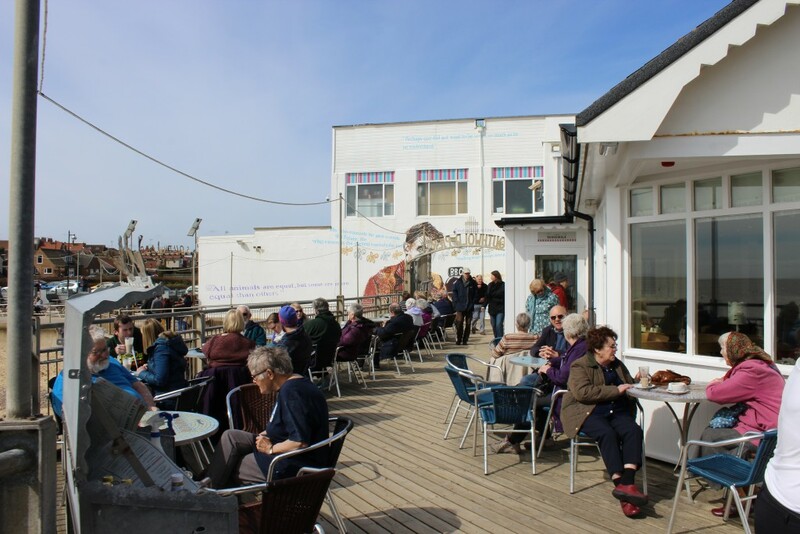 It was a glorious Spring day so by the time I had finished looking around on the pier there were lots of people enjoying a drink and lunch overlooking the sea and its far reaching views. 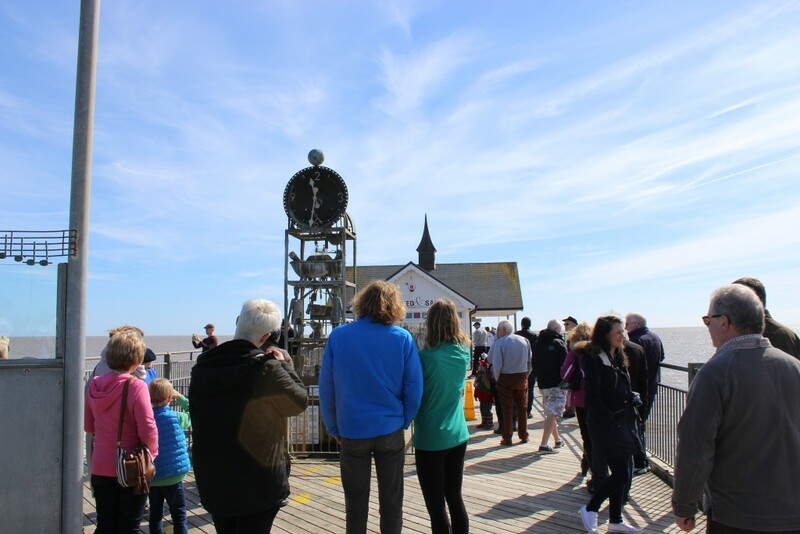 As you head towards the end of the pier you will more than likely come across a crowd of people all looking at the Waterclock patiently waiting for it to spring into action! 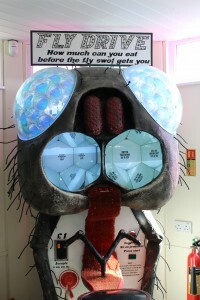 The waterclock always attracts the crowds! One of the great things about the pier is that even on a rainy day you can still have a lovely time. A favorite thing of mine to do on a winters day is to sit down and have a coffee inside the ‘clockhouse’ -all warm and cosy looking out across the sea and it’s dramatic waves and coast beyond. 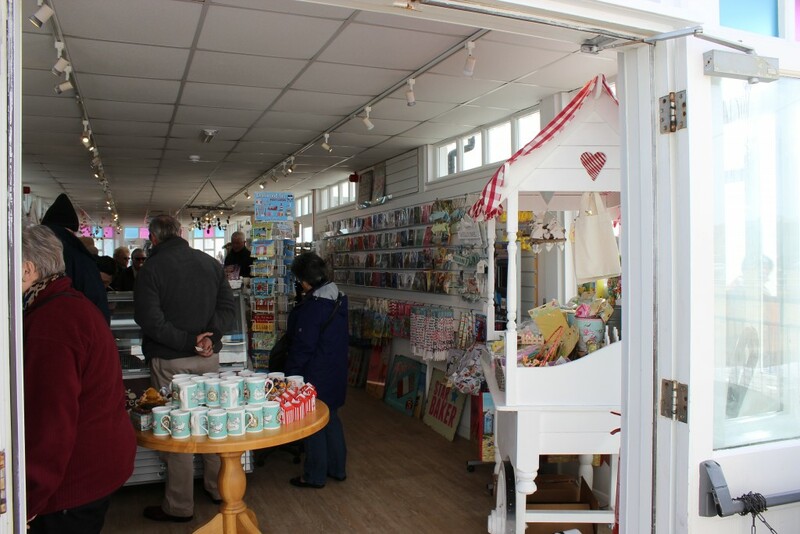 After coffee you can then just walk down the pier popping in and out of the shops along the way! Ice cream on the pier – well it wouldn’t be the same without one! With so much to see and do on the pier don’t forget to look ashore at the fantastic view of the lighthouse, beach huts and beach! 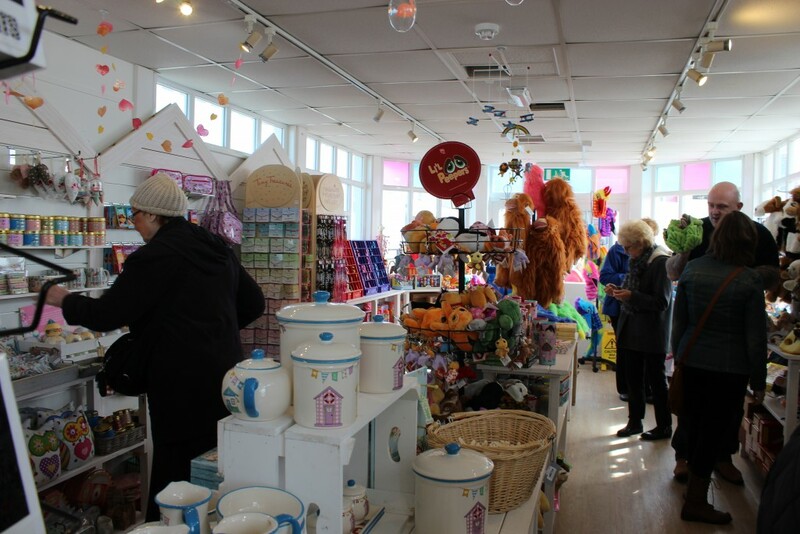 and with the pier just a five minute walk from the town and it’s lovely selection of independent shops, Southwold is a perfect place to spend the day whether you are on holiday or lucky enough to live in Suffolk. Visiting Southwold Pier has been a great start to my Suffolk top 50 Challenge and I had the added bonus of timing my trip on a spectacular spring day with sun shining and not a cloud in the sky. 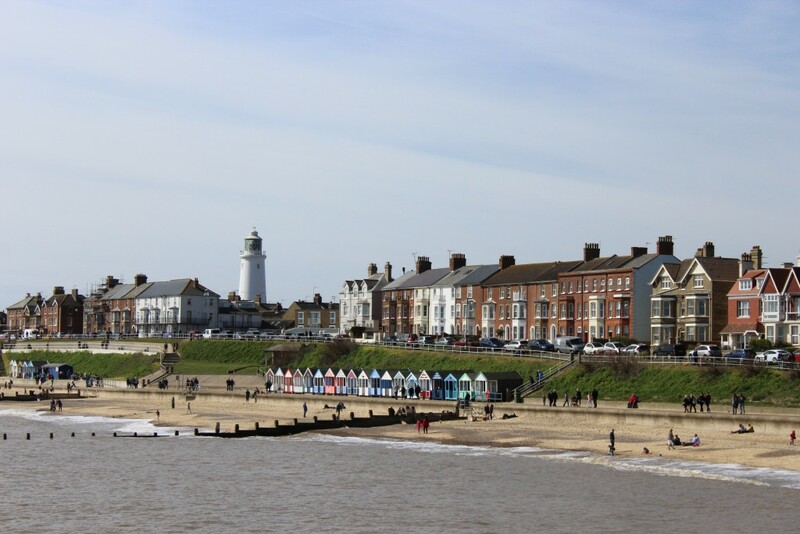 I now have the difficult decision on choosing where to go next from the list – Southwold and the Pier are going to be difficult to beat for a fab day out!